Stress, if harnessed properly, can be of great assistance, but if you lose control, the effects of stress can easily become your worst enemy. Stress is known to affect all systems in the human body by influencing a large array of functions through its effect on chemical messengers like cytokines. Stress hormones may also affect mitochondria. Mitochondria are the power house of virtually every cell in the body and they generate approximately 90% of the body’s energy in the form of ATP and also are key regulators of cell survival and death. This important cell structure has the capacity to regenerate, known as mitochondrial biogenesis, but unrelenting stress may mitigate mitochondrial biogenesis. Repeated stressors may promote further challenges to the stress-response system known as the hypothalamic-pituitary-adrenal (HPA) axis. When cortisol is produced in sufficient enough amounts, retro-inhibition or a feedback mechanism occurs, but in some cases the retro-inhibition does not occur. 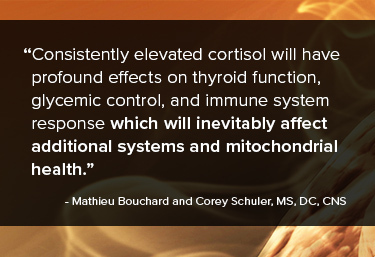 Consistently elevated cortisol will have profound effects on thyroid function, glycemic control, and immune system response which will inevitably affect additional systems and mitochondrial health. Energy and overall health status depend of the function of mitochondria, and even if the body can replace faulty or damaged mitochondria, it is best to promote a healthy stress response physically and psychologically. After starting his adventure in the fitness industry, Mathieu Bouchard is now working at his own clinic in Montréal, Québec. He is the founder of Institut AAT, a continuing education institute supporting trainers, naturopaths, and other health-related professions. He is also a graduate of Functional Medicine University. Corey Schuler is the Director of Clinical Affairs for Integrative Therapeutics. He is a certified nutrition specialist, licensed nutritionist, and chiropractic physician board-certified in clinical nutrition. He has earned degrees in nursing and phytotherapeutics, and has a private integrative medicine practice in Hudson, Wisconsin. Dr. Schuler is an adjunct assistant professor at the School of Applied Clinical Nutrition at New York Chiropractic College. He volunteers for the Board of Certification for Nutrition Specialists and is a member of Institute for Functional Medicine, American College of Nutrition, and American Nutrition Association. He has conducted dozens of national seminars, media, and podcast interviews including CBS-WCCO and other radio stations, Intelligent Medicine, Underground Wellness, Five to Thrive Live, Aging but Dangerous, Rebel Health Tribe, and countless online summit appearances. He is on the board of directors for the International Probiotics Association and an advisor to Functional Medicine University. Brownlee, M. (2001). Biochemistry and molecular cell biology ... Nature, 414(6865), 813-820. Du XL, Edelstein D, Rossetti L, et al. Hyperglycemia-induced mitochondrial superoxide overproduction activates the hexosamine pathway and induces plasminogen activator inhibitor-1 expression by increasing Sp1 glycosylation. Proc Natl Acad Sci U S A. 2000 Oct 24;97(22):12222-6. Soto-Urquieta MG, López-Briones S, Pérez-Vázquez V, et al. Curcumin restores mitochondrial functions and decreases lipid peroxidation in liver and kidneys ... Biological Research. 2014;47(1):74. doi:10.1186/0717-6287-47-74. Sivitz WI, Yorek MA. Mitochondrial Dysfunction ..: From Molecular Mechanisms to Functional Significance and Therapeutic Opportunities. Antioxidants & Redox Signaling. 2010;12(4):537-577. doi:10.1089/ars.2009.2531. Fiorentino TV, Prioletta A, Zuo P, Folli F. Hyperglycemia-induced oxidative stress and its role ... Curr Pharm Des. 2013;19(32):5695-703. Mullington JM, Simpson NS, Meier-Ewert HK, Haack M. Sleep Loss and Inflammation. Best practice & research Clinical endocrinology & metabolism. 2010;24(5):775-784. doi:10.1016/j.beem.2010.08.014. Menshikova EV, Ritov VB, Fairfull L, Ferrell RE, Kelley DE, Goodpaster BH. Effects of Exercise on Mitochondrial Content and Function in Aging Human Skeletal Muscle. The journals of gerontology Series A, Biological sciences and medical sciences. 2006;61(6):534-540. Jaiswal N, Maurya CK, Arha D, et al. Fructose induces mitochondrial dysfunction and triggers apoptosis in skeletal muscle cells by provoking oxidative stress. Apoptosis. 2015 Jul;20(7):930-47. doi: 10.1007/s10495-015-1128-y. Yuzefovych LV, Musiyenko SI, Wilson GL, Rachek LI. Mitochondrial DNA damage and dysfunction, and oxidative stress are associated with endoplasmic reticulum stress, protein degradation and apoptosis in high fat diet-induced insulin resistance mice. PLoS One. 2013;8(1):e54059. doi: 10.1371/journal.pone.0054059. Panickar KS, Jang S. Dietary and plant polyphenols exert neuroprotective effects and improve cognitive function in cerebral ischemia. Recent Pat Food NutrAgric. 2013 Aug;5(2):128-43. Charles AL, Meyer A, Dal-Ros S, et al. Polyphenols prevent ageing-related impairment in skeletal muscle mitochondrial function through decreased reactive oxygen species production. Exp Physiol. 2013 Feb;98(2):536-45. doi: 10.1113/expphysiol.2012.067496. Pratte MA, Nanavati KB, Young V, Morley CP. An Alternative Treatment …: A Systematic Review of Human Trial Results Reported for the Ayurvedic Herb Ashwagandha Withania somnifera). Journal of Alternative and Complementary Medicine. 2014;20(12):901-908. doi:10.1089/acm.2014.0177. Jyoti S, Satendra S, Sushma S, Anjana T, Shashi S. Antistressor activity of Ocimum sanctum (Tulsi) against experimentally induced oxidative stress in rabbits. Methods Find Exp Clin Pharmacol. 2007 Jul-Aug;29(6):411-6.